Nirvana continues its march to destroy Wendy's guild along with a dark secret. Team Natsu and the coalition - as well as an unexpected ally - go full-force against the top sorcerers of Oracion Seis to expel the ancient city's evil curse before it becomes unstoppable! 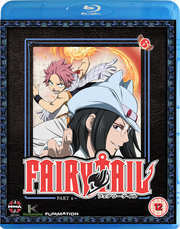 Then, when Natsu goes on a mission to see a woman about a dragon, his trip becomes a trap that could force him to turn Magnolia into ash and rubble! Can his friends snuff the Salamander's involuntary rampage without torching their friend?